Just when did potatoes become a "bad food"? Spuds have a nearly iconic presence in my family kitchen. We take them so seriously that on Thanksgiving Day, the only people allowed to *touch* potatoes during their transformation into mashed potatoes are my mother and myself. Boxed potato flakes? Please. Potatoes are such a perfect carbohydrate for the New England kitchen because they are locally abundant, whole food, amazingly adaptable to a variety of dishes, and classically delicious. Sure, they are a bit high in the glycemic index, but if you keep your portion sizes reasonable - balanced with ample vegetables and some healthy forms of protein and fat - potatoes can be quite healthy. The average tater weighs in at just 220 calories (and large potato easily serves two - really!). It provides a modest serving of both protein and fiber (about 5 grams each), vitamin C, B vitamins, and iron. Local potatoes are flooding the Co-op shelves right now and will often be available as late as November and December when other forms of local produce are slim. I especially encourage you to check out the purple potato variety when it's available - it has a similar antioxidant value as kale and a gorgeous, shocking hue, yet it tastes just like any other potato. Stock up, and be sure to store them in a cool, dark, dry place that is well-ventilated. Sunlight turns them green, which makes them more bitter and mildly toxic. Moisture encourages mold and sprouting. 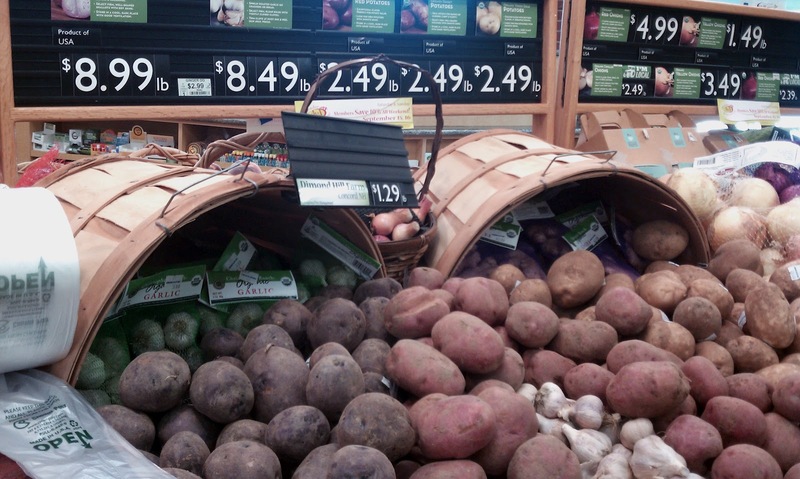 Depending on storage conditions and variety, potatoes can store for weeks to months. This recipe serves two and can be multiplied for more. Be sure that your pan size allows the potatoes and onions to be in a single layer with some space in between, otherwise they won’t brown well. Cutting potatoes small, using cast iron, and adding a lid ensures the potatoes bake on the stove top. For a crowd, bake the potatoes and onions in the oven and serve with scrambled eggs on top. Heat medium cast iron skillet over medium heat while chopping potatoes. Add oil, toss the potatoes in the pan, cover. Chop onions. Toss potatoes; when they’re a little golden, add onions to the pan, keep covered. Add more oil if necessary. Prep eggs and cheese. Whisk them together with salt and pepper. Add rosemary and crushed red pepper to skillet. Keep tossing the potatoes and onions, add some salt and pepper to them. When they’re cooked and golden, push them to the side of the pan and pour the eggs/cheese in the middle. Scramble everything together until the eggs are cooked. Serve on a bed of greens. Approximately 350 calories per serving. Of course, potatoes lend themselves to a wide range of recipes. Click here for a searchable listing of more than 600 recipes from EatingWell.com.